Made from long-lasting leather any nylon with cushioned removable inserts, these boots aim to give the wearer’s comfort and durability as well as a slip-resistant outsole to increase grip. Bates, manufacturing this ultra-lites boots, have been an invaluable asset to uninformed personal for over 10 years. They are built with high-quality leather and nylon and are kitted out with a breathable membrane to keep your feet nice and cool. Perhaps the oil and slip-resistant rubber sole is their strongest feature as it allows the wearer to walk across slippery or uneven surfaces at ease and successfully qualifies for the SATRA WTM 144 test for slip resistance. The lightweight cement construction makes them easy to wear for numerous hours and the fact that the entire boots are non-metallic (no metal toes or eyelets) means they are a perfect solution for electronic security environments. The mesh lining allows the boots to be really breathable so that your feet do not become overheated. As a result, it also keeps the boots smelling much fresher and they are easier to clean in general. However, because of the mesh lining, they are not completely waterproof although they are water resistant and will keep your feet dry in slightly wet conditions. They would not be the ideal choice for use in a constantly wet environment. Although non-metallic, these tactical boots do come with a safety toe to protect your feet so as a result, these boots are more than adequate for protecting your feet against most outdoor and indoor hazards. For the benefit of the consumer, the rubber outsole is now 30% lighter than the original model meaning that there are no issues with wearing these boots for long hours as they are much lighter and more comfortable. The fitting is nice and snug and really moulds to the individual’s feet, because of the flexible athletic construction, to give the maximum possible comfort. These boots almost feel like sports boots because of how light and flexible they are but they are also sturdy enough to support and stabilise your feet. The standard product dimensions are 12 x 8 x 4 inches. Although not the highest quality boots on the market, they are a reasonably good deal for the price that they cost, approximately $90. They have cushioned insoles to increase the comfort but they are thin and so wear out quite quickly. Some of the design aspects appear to have been crafted on a budget as the laces and side zipper’s feel a bit cheap. That being said, they are reasonably durable and should you at least a year of regular, intense use. The nylon webbing is prone to fraying on the side of the boot which can reduce the breathability of the boot. Overall the boot is good for the price it is at but in terms of boots, you do get what you pay for in terms of quality. 1It is recommended to purchase new inserts for the boots as the standard ones, although extra padding makes them comfortable, tend to wear down quickly and leave a rather uncomfortable base to the shoe. If you invest in a good pair of insoles the quality and durability of the boots greatly increase. 2The warranty on the boots is not customer friendly. They are very difficult to arrange with and demand several pictures before you receive a $25 and insist you fix it locally. Often the cost of fixing them is much more than $25 and you end up out of pocket. 3The boots are lacking in arch support and if you wear them for many hours, you may wake up the next day with pains in your arches. This issue can be improved by buying new inserts that better mould to the shape of your feet as these boots do not mould particularly well to the individual’s foot. 5The best part about the boots is their slip resistance and if you are working in slippery or oily conditions, these boots are a must have as they really do keep you very stable. Even if the soles become really, really wet, they maintain a good grip. It’s no wonder that they passed the SATRA WTM 144 slip resistance footwear test! Are the soles non marking? Yes, they are but they do squeak a bit when in contact with shiny floor surfaces. Would a waterproofing spray make them water resistant? Not really since water can pass through the mesh lining. How long of a break in do they require? They are broken in very quickly as they are very soft and lightweight. They take very little time to break in and are usually quite comfortable, to begin with, but the issue with them is, that after a few months the cushioned inserts in the boots begin to wear down, leaving a rather uncomfortable base behind for the feet. This can be fixed of course by regularly buying replacement insoles. 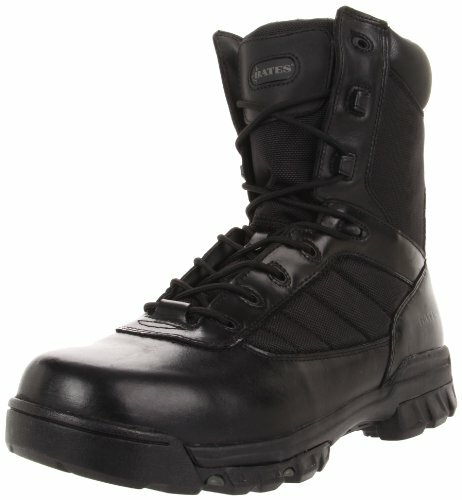 If you are looking for a pair of tactical boots that you would be wearing for many hours every day, it may be wiser to spend about $80 more and getting a higher quality, more comfortable pair.